During the Republican National Convention we’ve been hearing a lot about two key themes: personal freedom and personal responsibility. I am a big fan of both. I value and cherish my freedom and feel great empathy for people who live in places where they are severely restricted in their ability to speak their minds, to move about freely, or even to wear what they want to wear. As a corollary I also feel great responsibility: to value and protect those freedoms, to care for the place where I live and the people who live here, to pull my weight and make a worthwhile contribution to my community. 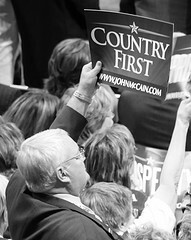 I wondered what examples candidate McCain and his running mate Palin would give in their exploration of these two themes. I wondered if there would be discussion of our important Bill of Rights and how we must defend it. I wondered if there would be talk about our responsibility to protect the land where we live, the air we breathe, and the water we drink and to care for one another.